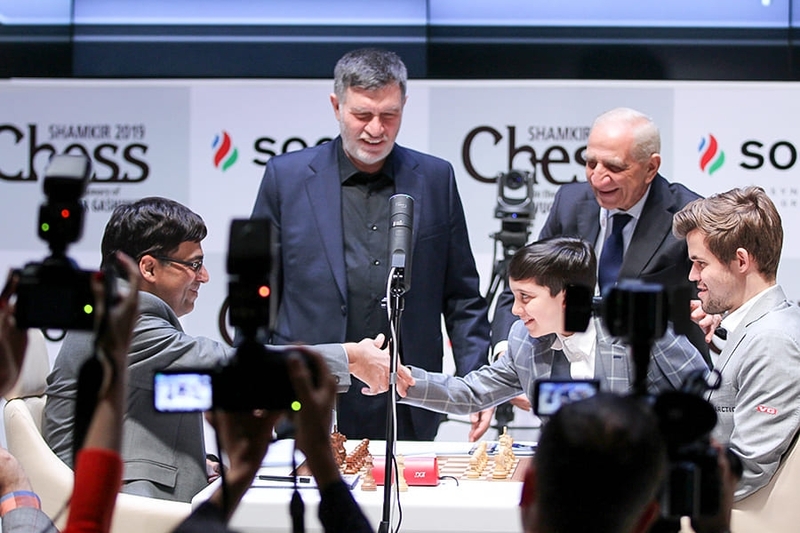 Magnus Carlsen beat Vishy Anand for a second game in a row as the Gashimov Memorial in Shamkir exploded into life in Round 2. 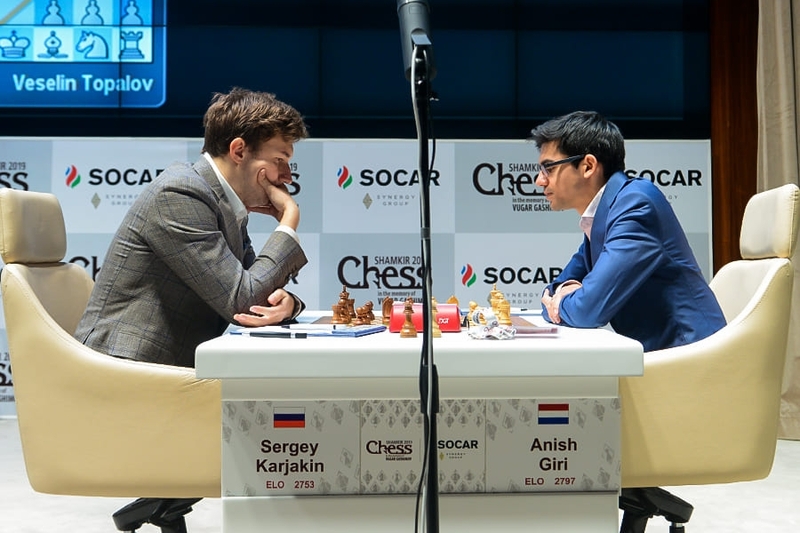 It was April Fools’ Day, but no joke that Anish Giri and Sergey Karjakin played one of the wildest elite level games we’ve seen in a while before Sergey picked up a full point. 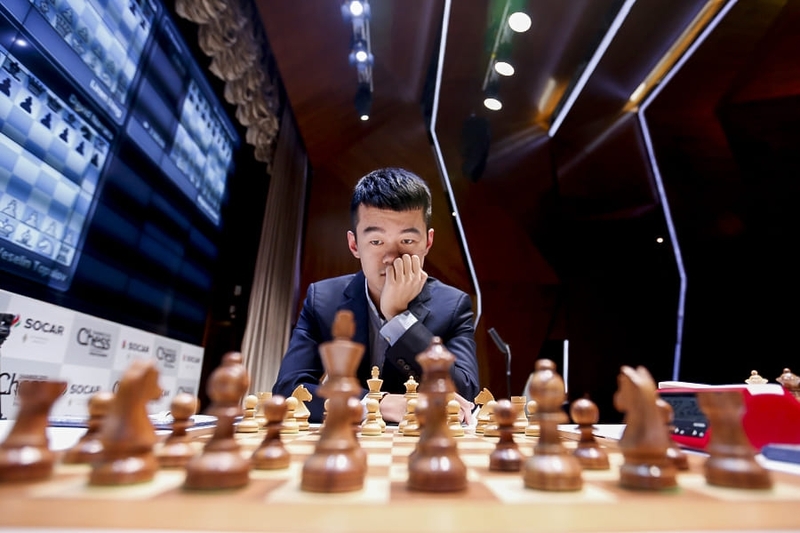 Ding Liren was the other winner, after unleashing a tactical blow on Alexander Grischuk in the middlegame. 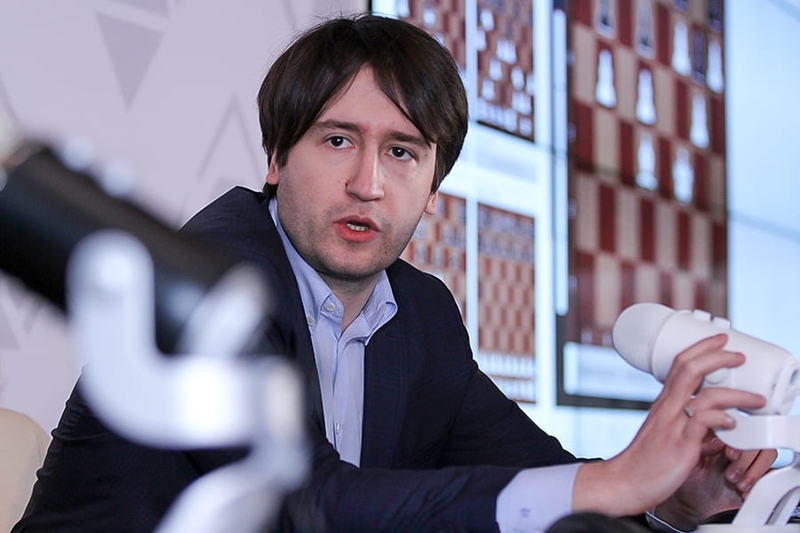 David Navara survived another opening disaster to draw, this time against Veselin Topalov, while Mamedyarov-Radjabov was the only dull and predictable draw. 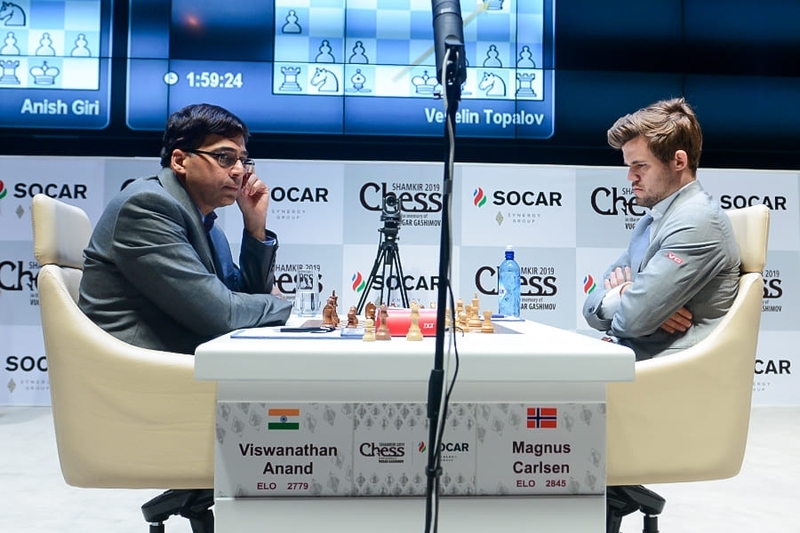 The big clash of the day, Carlsen-Anand, got off to a curious start, as Vishy repeated the 10…Rd8 line of the Queen’s Gambit Declined that Fabiano Caruana had used to rock Carlsen in Game 2 of their World Championship match in London. Back then Magnus thought for 17 minutes before “chickening out” with the safe 11.Be2, but it seems his intuition was good, since he played that move again in Shamkir. In the meantime Levon Aronian had tried 11.Nd2 against Fabi in the Grand Chess Tour finals in London, and been met by powerful play that led to a draw. 25…Qc3 is really bad. It goes from being from being a pretty much equal position to one where I can press and he has to defend accurately. 26.Qxc3 Rxc3 27.a5! Rxb1 28.Rxb1 Rc5?! A second blunder – Anand: “28…Ra3 is still a fairly comfortable hold”. 29.a6 g6? The last clear blunder of the game – 29…Bc8! was no bed of roses, but had to be tried. After 30.Rb7! 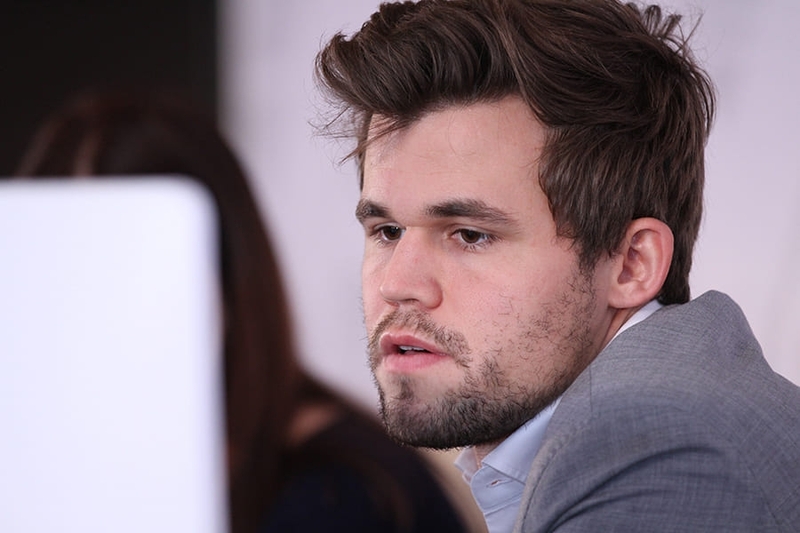 Magnus Carlsen was the last player in the world you wanted to be sitting opposite, since he demonstrated in the game, and then later in the press conference, exactly how to convert his advantage. Vishy Anand, who had dramatically missed a win on the first day, was understandably not looking forward to spending too much time in the press conference, and requested that he could leave after giving some thoughts on the game. He did so, and Magnus had no complaints whatsoever! I think he behaved absolutely normally… And besides, I’m certainly not one to give lessons on leaving press conferences prematurely! In general I believe in classical chess it’s a good idea not to have increment because it gives an extra dimension to the game in that you have to spend your time well and ration it rather than just relying on the increment… It’s a very nice change of pace. The second game to finish decisively was Giri-Karjakin, with two players at times unfairly known for cautious chess playing a slugfest. It was Anish Giri who struck first, after striking gold with his preparation in the Giuoco Piano when he found 10.d4!? Now was the time for 20.Bxh6!! gxh6 21.Nh4! and then 22.Rg3+ and 23.Qh5. Those last three moves were Giri’s plan, but after he started with 20.Nh4?! he was hit by 20…Qe8! and he realised his weak e-pawn stops his attack (21.Rg3 runs into 21…Rxe5!). The difference after first sacrificing a piece is that swinging the rook to g3 comes with check, giving White a crucial extra tempo. White’s attack looks fantastic, and any king move loses, but Black has 30…Rg7, or the even better move he played in the game, 30…Qxg6! 31.Qxg6+ Rg7 and if the queen tries to move 32…Rg2+ is mate-in-3. After the forced 32.Qxg7+ White’s position was in ruins and he resigned a couple of moves later. 20.Bxh5! was a fine bolt from the blue, with the point that after 20…gxh5 21.Qxh5 the bishop on h3 has no squares! Commentator Arkadij Naiditsch’s first choice was 60.Kg6, which he assumed was winning, but Grischuk had spotted that he manages to give a perpetual there. Unfortunately for him, Ding Liren correctly played the alternative 60.g4!, when after 60…Qxg4+ White has mate-in-5 starting with 61.Kg6, while after 60…Nxg4 White could win the knight with check. Grischuk now had the luxury of increments, but all needed to do was avoid some traps in the queen ending before Black resigned on move 77. 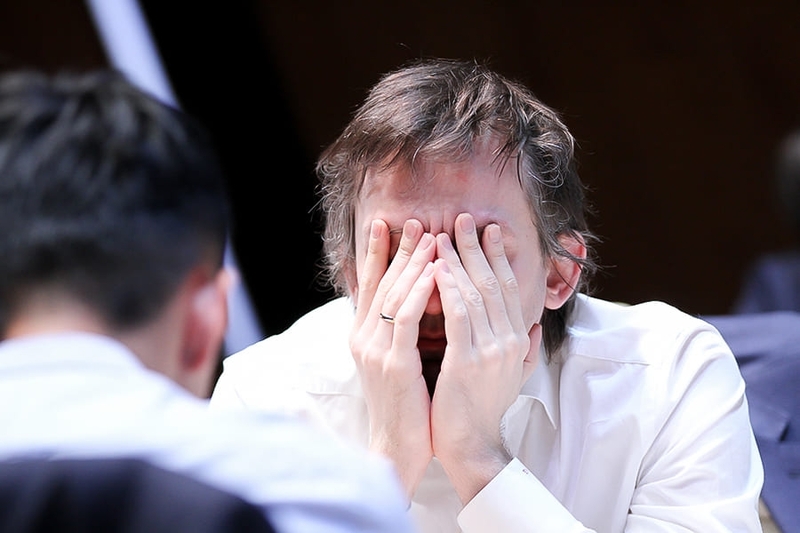 The remaining games were drawn, but Topalov-Navara could easily have brought victory to Veselin Topalov. David Navara was outprepared for a second day in a row, and commented, “It was kind of silly - I was out of book on move 6 again!” He was taken by surprise by 6.Qg4 in the Caro-Kann, though he mentioned he knew that it had been covered by Adhiban in the New in Chess Yearbook. Once again he was in serious trouble, both on the board and on the clock, but once again, as against Vishy, he managed to find enough resources to hold a draw, this time in 55 moves. A draw in a round-robin, cobbled together in an hour, should be equated with deceiving the public’s trust. The complaints are to White, of course. His point was that the players were just following the rules, and that if FIDE want to exclude drawn games they should consider the rules of chess or individual competitions. Given what happened in the remaining games of the day, however, quick draws didn’t feel like a big issue! 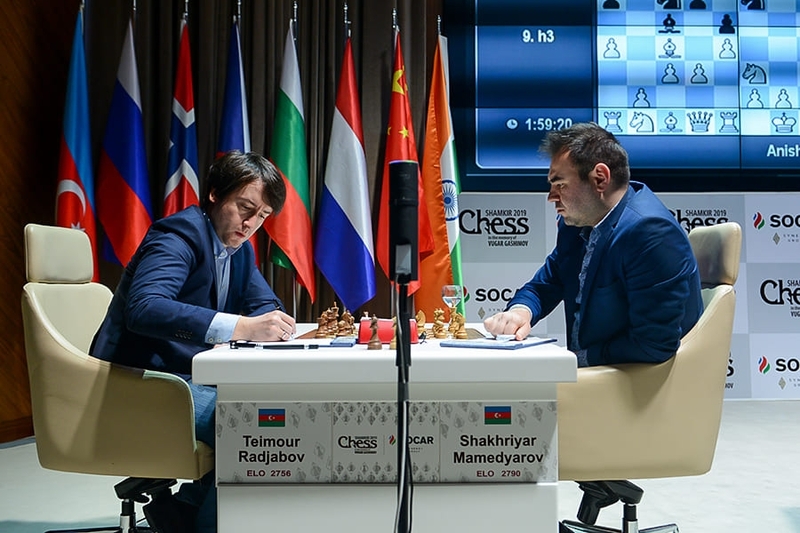 Magnus Carlsen, Ding Liren and Sergey Karjakin are therefore the early leaders in Shamkir, with some juicy looking ties such as Navara-Carlsen, Karjakin-Topalov and Anand-Mamedyarov in Round 3. Tune in to all the action from 13:00 CET live here on chess24!